When a fellow taco hound emailed me and said they make the trip all the way from Agoura hills to a taco truck in East LA called Tacos El Korita I knew I was in for something special. So thursday afternoon I made my way east out of downtown LA in search of this glorious truck. It was just after 5pm when I made it to East Olympic Blvd. Taco trucks started popping up everywhere, a mariscos truck in a parking lot with a tent and table setup, a taco wagon across the street. 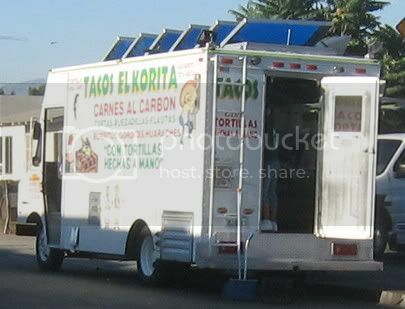 As tempting as it was to pull over at the first taco truck in view I was in search for the famed Tacos El Korita. I order the taco trifecta - asada, carnitas, and al pastor. A hunk of pork twisted on a vertical spit, a tortilla press clamped next to the grill with the cook forming fresh masa into the press and then tossing the fresh corn tortillas on to the grill. Tubs of salsas and condiments- marinated carrots, jalapenos, a salsa verde, roja and pico de gallo were set on the counter attached to the truck. Everything starts with the tortillas hecho a mano(homemade). The carnes are excellent and skillfully prepared but it is the homemade tortillas that leave the lasting impression. The carnitas had a crunchy texture and a soft moist center, the asada charred and peppered and the al pastor packed with juicy chunks of seasoned pork.All were delicious and complimented by an intense roja that brought the heat and a smokey salsa verde that complimented the carnitas perfectly. The salsas reminded me of king taco, especially the verde. The roja wasn’t as thick as the King’s but it’s intensity and flavor rivaled some of the best roja’s i’ve had on this taco journey. The strip of east olympic off the 710 and 5 freeway is a taco mecca. The trail of taco trucks culminates where the 710 and 5 meet with a massive King Taco that looms large over the taco landscape. This is the major leagues where only the big players in the taco scene lay down their taco fare. 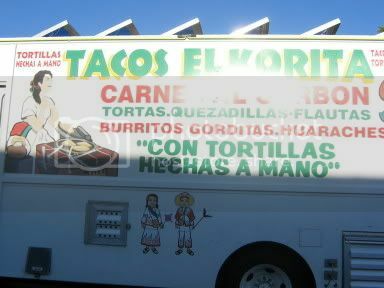 Wow, tortillas a mano in a taco truck, that's gotta be a first. I bet that doesn't even happen in Mexico. King Taco, for all it's shortcomings, seems to have set a standard with their red and green salsas, a hot smoky red concoction that is irresistible, and the charred tomatillo green that is milder and almost as good. It's no wonder they got all stingy in the early 90's and used to charge you 50 cents for every lil' cup of extra salsa, that practice has gone away, surely the customers made them know how wrong that was. The Rodeo Grill in Echo Park makes a decent copy of the KT red. I wonder if ex-workers take their salsa knowledge to different taco joints, since it seems most places like to keep info about their salsas quite secret. The imagery of Olympic/710 as the Taco Mecca, the Major Leagues, that sounds about right, I'll have to concur! 50 cents for a cup of salsa? yikes... I didn't discover king taco until the mid 90's.They probably stopped that practice by then. I read an article about King Taco where the owner said the red salsa is prepared at a seperate site and only family members know the recipe. The practice of asking 55 cents for a tiny cup of salsa has not gone away. At least the cook named Pancho at the Washington and San Pedro location wants 55 cents. Are they dreaming? 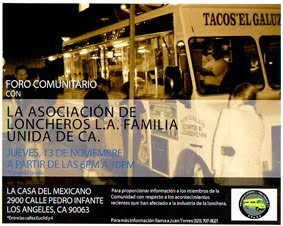 Do they think they are the only taco joints in LA? What a freaking joke. 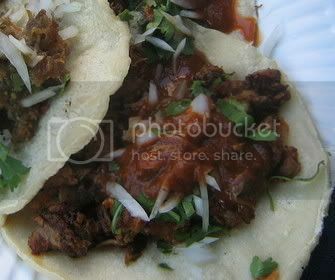 Will never go to KT anymore knowing there are soooo many great taco joints in this site. Thanks alot Bandini. Boooooo KT. I went to El Korita last night! 35 people crowded around this hotbed of taco activity. It was unbelievable!!!!! The meats were perfectly prepared, full of flavor; the tacos were large; the tortillas were magnificent, soft, aromatic, and delicious; the salsas and condiments were plentiful and packed just the right kick. Thank you for the recommendation! It is most definitely worth going out of one's way for. Bandini was right, the handmade tortillas leave a lasting impression. 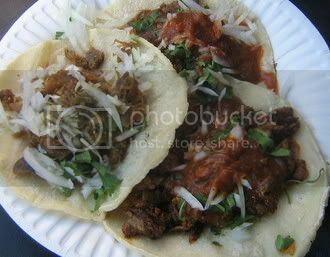 I went on (07/30/07) and tried the carne asada and al pastor tacos. The asada was over charred and cut into thin strips which killed the flavor of the meat. The al pastor however was awesome. Eventhough the spit was not in use, the al pastor was tender and very tasty. The meat and sauce came togther to make the tortilla that much more special. The salsa bar here is nice cause it has everything you need and as much as you need. I left with a great memory of this truck so I came back a week later (08/06/07) with some more friends. I told them about the al pastor and we all had some. I also tried the carnitas and the tripas. The carnitas was tasty but dry and a little too salty. The tripas was also too salty and very chewy. I saved the al pastor for last and was hoping it would clean my mouth of the other meats but that too was disappointing. It was nothing like it was the week before. This time the meat was chewy, the sauce too sweet, and altogether gross. I had to apologize to my friends for hyping it up for them. I still remember my first trip so I am hoping my next trip back there will be good but if not no more El Korita for me.